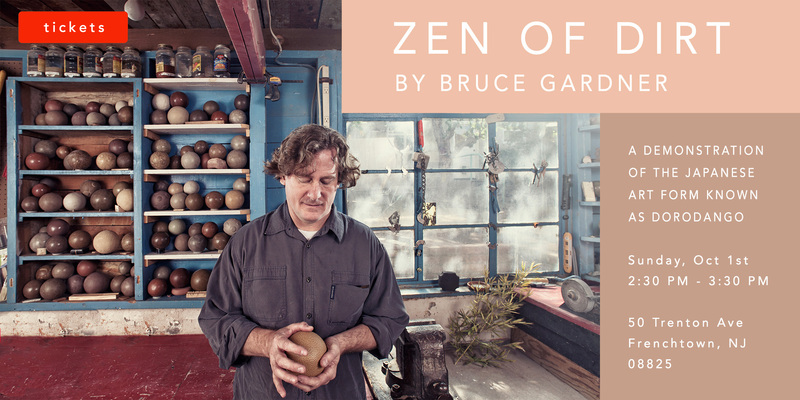 Bruce Gardner specializes in the Japanese art of Hikaru Dorodango. They are balls crafted from soil, molded by hand into perfect spheres, dried, and then polished to create a sheen. This is a traditional pastime among many children in Japan, and through many years of perseverance Bruce has been able to refine the process himself and has added his own techniques to create one of a kind spheres from local soils found near his own home in New Mexico. During his stay at Frenchtown, NJ, Bruce will be offering a 1-hour demonstration of his process. We invite you to join us in this unique experience at the yard or ArtYard’s residency at 50 Trenton Ave, Frenchtown, NJ 08825. Please park at 62A Trenton Ave where The Lovin’ Oven restaurant is, and walk to 50 Trenton. PS. Participants don’t need to bring any materials. This is a demonstration so we will be watching Bruce work and explain his process. Taking photos is allowed.